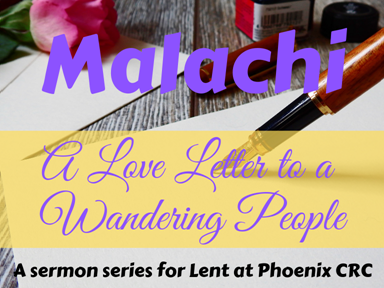 At Phoenix CRC, we’re going through the book of Malachi for the season of Lent which leads to Easter. God’s prophets typically call people back to God and the prophet Malachi is no exception. We’re calling the series – A Love Letter to a Wandering People – because Malachi wanted the people to turn closer to God. God still wants that for people today. You’re invited to worship God with us this Sunday starting at 9:30am. You can also listen to the service live by phone, at (623) 295-0285 or on the internet at www.uberconference.com/phxcrc, during the worship service.